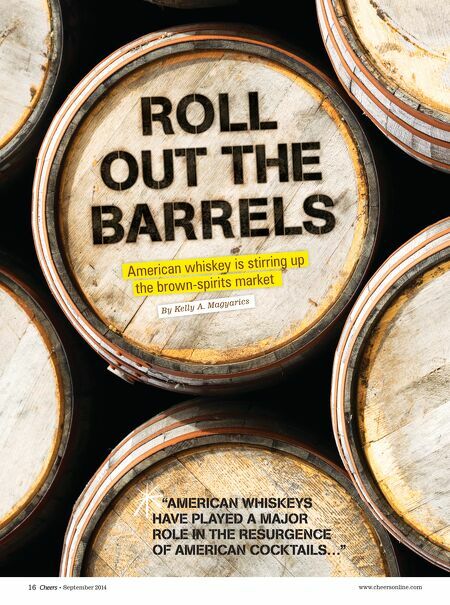 www.cheersonline.com 17 Cheers September 2014 • C onsumers have taken a shine to American whiskey: Consumption of the spirit increased 4.9% in 2013, according to the Beverage Information Group, the research arm of Cheers' parent company. That amounts to 22.5 million 9-liter cases sold last year. Big brands are increasingly joined by offerings from smaller craft distilleries, as bourbon and rye are sipped neat and in cocktails. And forward-thinking distillers are using modern techniques to coax out unique flavors. 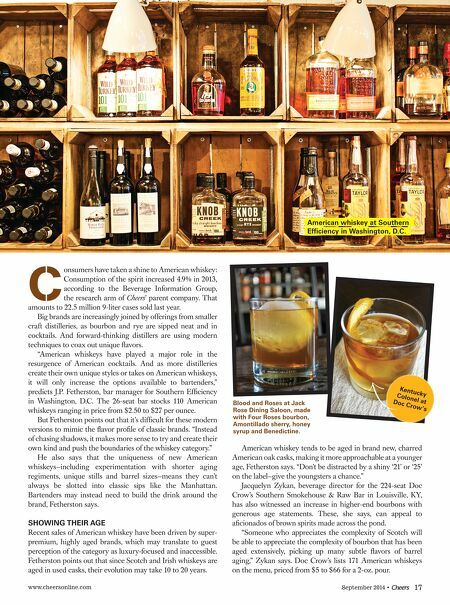 "American whiskeys have played a major role in the resurgence of American cocktails. And as more distilleries create their own unique styles or takes on American whiskeys, it will only increase the options available to bartenders," predicts J.P. Fetherston, bar manager for Southern Efficiency in Washington, D.C. The 26-seat bar stocks 110 American whiskeys ranging in price from $2.50 to $27 per ounce. But Fetherston points out that it's difficult for these modern versions to mimic the flavor profile of classic brands. "Instead of chasing shadows, it makes more sense to try and create their own kind and push the boundaries of the whiskey category." He also says that the uniqueness of new American whiskeys—including experimentation with shorter aging regiments, unique stills and barrel sizes—means they can't always be slotted into classic sips like the Manhattan. Bartenders may instead need to build the drink around the brand, Fetherston says. SHOWING THEIR AGE Recent sales of American whiskey have been driven by super- premium, highly aged brands, which may translate to guest perception of the category as luxury-focused and inaccessible. Fetherston points out that since Scotch and Irish whiskeys are aged in used casks, their evolution may take 10 to 20 years. American whiskey at Southern Efficiency in Washington, D.C. American whiskey tends to be aged in brand new, charred American oak casks, making it more approachable at a younger age, Fetherston says. "Don't be distracted by a shiny '21' or '25' on the label—give the youngsters a chance." Jacquelyn Zykan, beverage director for the 224-seat Doc Crow's Southern Smokehouse & Raw Bar in Louisville, KY, has also witnessed an increase in higher-end bourbons with generous age statements. These, she says, can appeal to aficionados of brown spirits made across the pond. "Someone who appreciates the complexity of Scotch will be able to appreciate the complexity of bourbon that has been aged extensively, picking up many subtle flavors of barrel aging," Zykan says. Doc Crow's lists 171 American whiskeys on the menu, priced from $5 to $66 for a 2-oz. pour. Kentucky Colonel at Doc Crow's Blood and Roses at Jack Rose Dining Saloon, made with Four Roses bourbon, Amontillado sherry, honey syrup and Benedictine.